Originally built in the late of 13th Century, Old Town of Lijiang covers an area of 7.279 square kilometers. It offers old buildings, colorful local customs, Naxi Ancient Music, Dongba Ceremony and pubs with different themes to explore. In low season, you could experience its unique charm more. 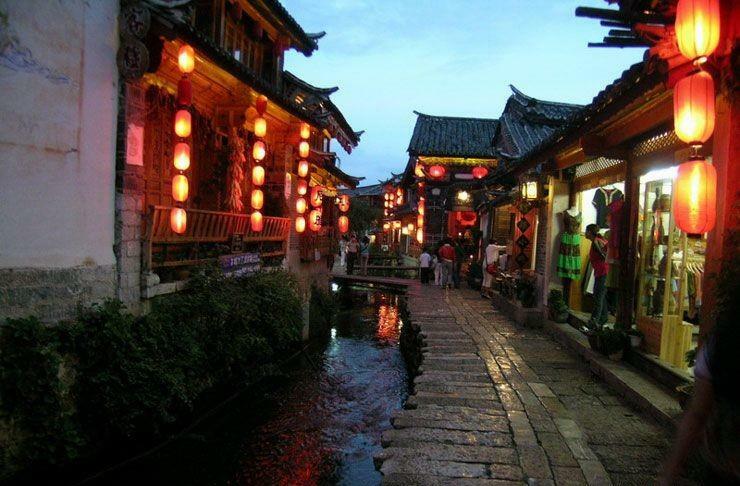 At the Old Town of Lijiang, it is recommended that you spend 1 day at least exploring it. If you are interested in Naxi culture and history, you could visit Mufu Palace and Naxi Hieroglyphics Painting Experience Hall. The palace is acclaimed as “the Forbidden City” in the Old Town of Lijiang. Dongba Culture Museum in the north of Black Dragon Pool is also ideal for those who love culture of ethnic minorities. Some 354 bridges lie in the Old Town of Lijang. Among them, Suocui Bridge, Dashi Bridge, Wanqian Bridge, Nanmen Bridge, Ma’an Bridge, and Renshou Bridge were originally built between the 14th Century and the 19th Century. Originally built in 1601, Five-Phoenix Tower is 20 meters tall. The tower looks like five flying phoenixes. The ceiling is painted with fine patterns. It is a combination of Han, Tibetan and Naxi style. Former Residence of Fang Guoyu is the best-preserved and large-scale typical courtyard among the residential buildings in the Old Town of Lijiang. If you would like to experience Dongba wedding, you could visit Naxi Renjia (纳西人家) at No. 63, Jishan Lane, Xinyi Street. You will get acquainted with Naxi wedding custom, traditional craftsmanship, and traditional Naxi culture. Traditional Dongba wedding is regularly held from 10:30 to 11:00 on Tuesdays and Saturdays. The opening hours are from 09:00 to 18:00. You could also enjoy the folk dancing and singing show there which is held from 10:30 to 11:00, from 14:00 to 14:30 and from 17:00 to 17:30 every day. If you want to explore temples, Wenchang Taoist Temple, Puji Lamasery originally built in 1771, Baima Longtan Temple, Jinglian Temple in the Naxi style and the best-preserved temple in the old town – Puxian Temple. The list of the attractions across the Old Town of Lijiang is endless. If you want to visit the Old Town of Lijiang in a quiet surrounding, it is suggested that you explore it in the daytime in low season. The old town is ideal for photographing all day. A few buses pass by the Old Town of Lijiang. Therefore, there are only a few options. Rent a vehicle from the City of Lijiang to the Old Town of Lijiang. This is the quickest and most direct option. Take Bus 12, 3 and Bus 21 to the Stop of Nanmen Street (南门街). Then, walk to the old town. Take Bus 2 and Bus 13 to the Stop of Old Town CarPark (古城停车场). Then, walk to the old town. Please take care of the entrance ticket with you as you will be required to present it when you are visiting some attractions in the old town. Please take an umbrella with you. Please wear the sunscreen cream and sunglasses with you. Interested in visiting Lijiang Old Town on a Tour? Wendy Wei Tours offers a variety of different packaged tours as well as custom tours including Lijiang Old Town, among other attractions and destinations. To find out more, please visit our Tours page or Contact Us directly to find out more.